Take a hard and honest look at where you are today. What you’ve achieved, what you’ve lost and what you gained and tell me; in a butterfly effect kind of chain of events, can you tell me how you got there? I can. I was 18 and in my third semester in the photography program in Cegep. It’s the holiday break and I just can’t wait to be a photojournalist. Tomorrow is January 8th and the forecast calls for -30 degrees Celsius overnight, something is bound to happen and I’ll be there for my big break. Keep in mind this is 1992, there are no cell phones, no internet, no computer and I have no car. Although I feel completely isolated from the rest of the world, I have this urge to fight back this isolation and shake things up, make it happen no matter what “it” is. Just managing films stock, development and distribution was a nightmare compared to today’s standards, but for some reason, on that particular night, nothing was gonna stop me. So on that night, I set-up my alarm clock. 5 O’clock is gonna come around fast and I’ve already tuned my radio to CKAC, a news channel. It is Siberian winter cold out there, and I have this feeling, which is way more than a hunch, more like an absolute conviction; I just know that a heating system is gonna go haywire overnight, that a fire is doomed to break out and all I have to do is be there to cover the story for my big break. My first published photography. 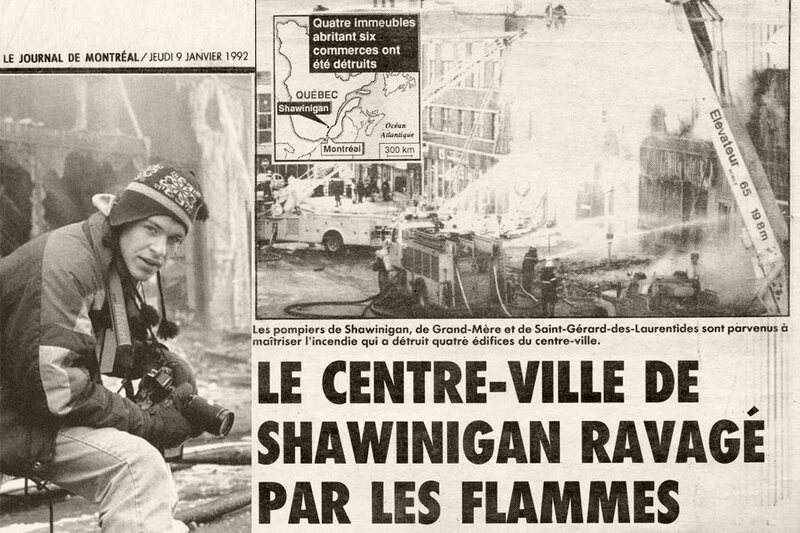 At 5 O’clock, that alarm yanks me out of bed and I am not even surprised to hear that a 5th alarm had been declared on a major fire…in Shawinigan which is a 1h30min drive from where I lived in Repentigny. (46°32’23.7″N 72°44’57.9″W) is where I need to get. I put on my layers of clothes and get going. Today, looking back, it looks like foolishness on my part to think I can hitchhike this entire way in this freezing cold and before the fire is out, but at that time, it was just good old faith that « life » was telling me to go there and « life » would take care of those petty details. When I got there, the fire was under control, but a thick cloud of smoke could still be seen from a distance. I did my best to capture the sheer size of the devastation with my limited equipment. I also got the opportunity to meet with representatives from the Trois Rivières newspaper, le Nouvelliste, which would later allow me to do substitute work during the summer holidays in 1992, but that’s almost another story. Once I got all that I needed, my mind was set on presenting those pictures to the main newspaper in Montréal; Le Journal de Montréal. In order to do this, I still had to get to Montreal quickly because tomorrow, these pictures would be worthless to them, but today, they were news. So now I have to find my way from Shawinigan to the corner of Frontenac and Mont-Royal in record time. I was hoping I wouldn’t have to hop from lift to lift too many times in order to make it and so I put my mind to it, asking and hoping for a single ride into Montréal. Within two rides I was next to the highway 40 entrance. Then a young couple picked me up and were they going there or is it out of the kindness of their heart, but an hour and 30 minutes later I was in the Journal de Montréal selling my pictures. One of the lab technicians came and picked up my rolls of films in order to process them. Once I gave the story to the editor and he got a go to publish it, he printed a few pictures to make a final selection. It was on page 2 of the January 9th 1992 edition of the Journal de Montréal, that my first ever photography was published. I got the freelance rate, a mighty 25$ and a few rolls of film to replace what I had used. I was overwhelmed with pride and joy. Not long after the 2016 Christmas Holidays, I looked for and found that picture’s negative. I thought it’d be interesting to share this story and the idea of printing this photography once more 25 years later is simply fascinating. A lot has happened in those 25 years and although it is a quite simple picture, it’s everything that brought me at that place at that time, what I did with this picture and everything that followed that makes it special and unique. That picture is when the butterfly in my life flapped it’s wings.